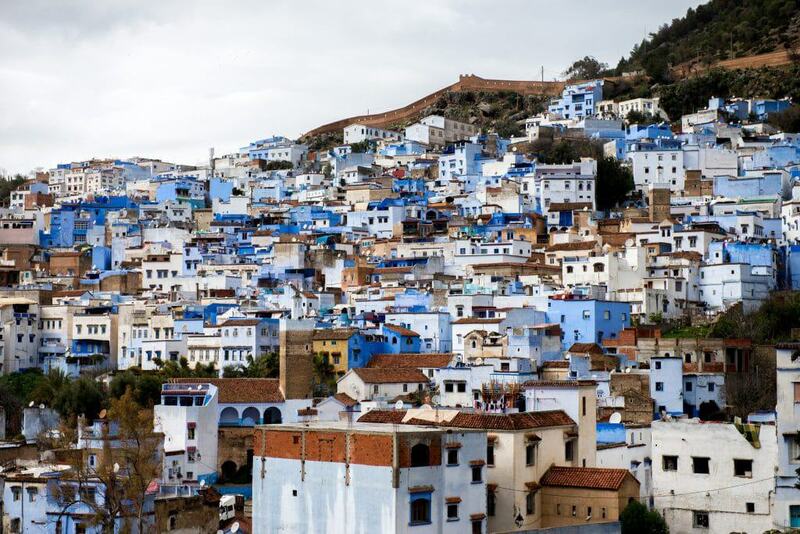 Chefchaouen means two horns in the Berber language, named for the topography of the mountains just above this quaint city, nestled in the Rif Mountains. 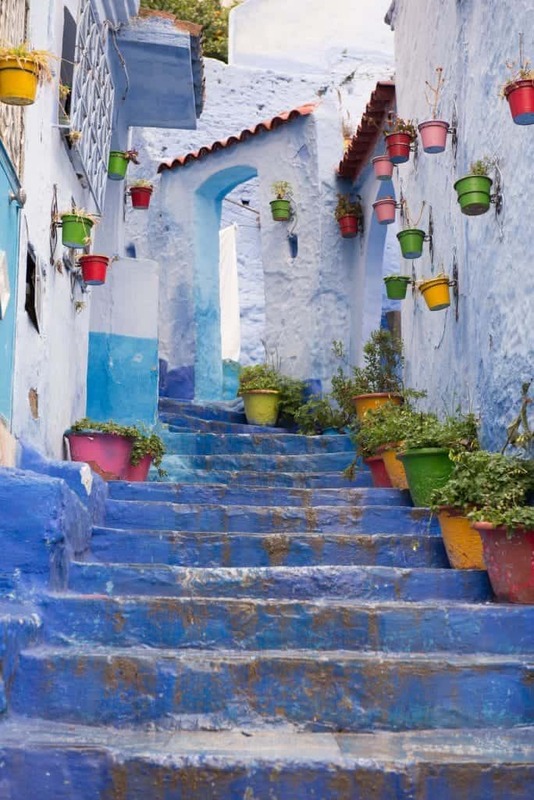 Known also as, the Blue City, the name is often shortened to simply Chaouen pronounced like shower with an “n” instead of an “r” at the end. We took a ferry across the Strait of Gibraltar from Tarifa, Spain. We arrived at the port city of Tangier where Mustafa, our driver, was there to greet us. He was to transport us to the Blue City. It was four of us traveling: my two sisters, my niece and me. My niece Casey, has spent the last few years living in Spain. She had made the trek several times to the port city with other visitors and had also spent time in Marrakesh. 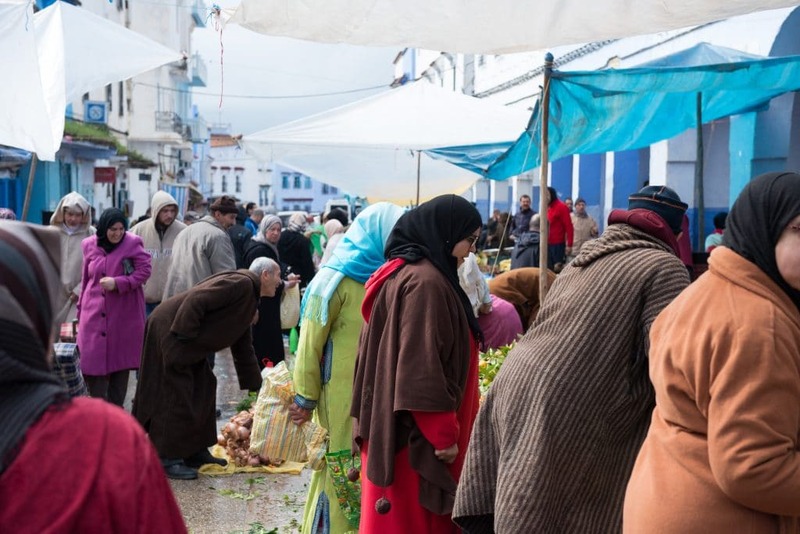 She forewarned us about the hustle and bustle of the port city of Tangier. She likened it to most border towns, teeming with unrelenting merchants, trying every trick in the book to lure the tourists to their wares. From such an experience, you get the totally wrong impression of the country and the people. We had made arrangements to simply bypass it altogether and head straight to the Blue City. The drive to Chefchaouen took about an hour and a half and was simply spectacular. Verdant pastures dotted the land, filled with cows, sheep, goats, donkeys and horses and lush green mountains were the back drop for the scenic drive. I am not sure how I expected the topography in Morocco to look, I guess it would have been more desert like, in my mind’s eye. It was a bucolic and beautiful surprise. When we arrived that Thursday afternoon, we discovered is was market day. 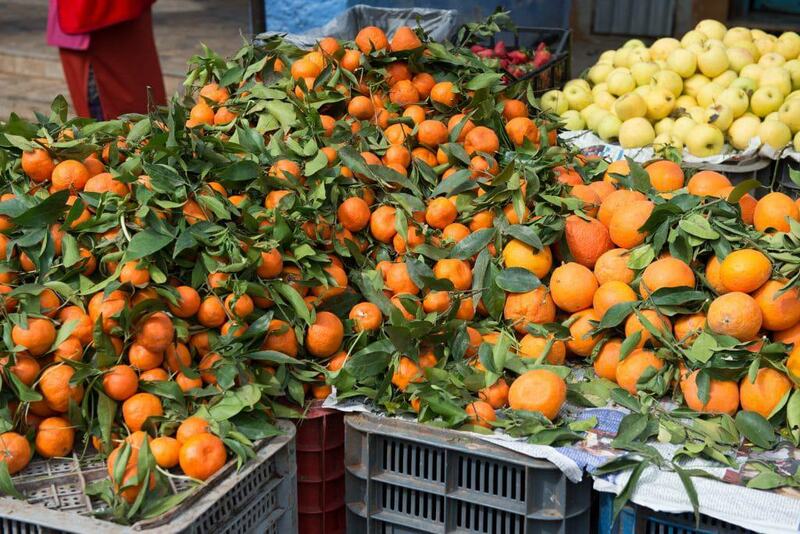 The town square was bustling with men and women who had come down from the mountains to sell their fresh fruits, spices, vegetables and beautiful bouquets of flowers to the locals. 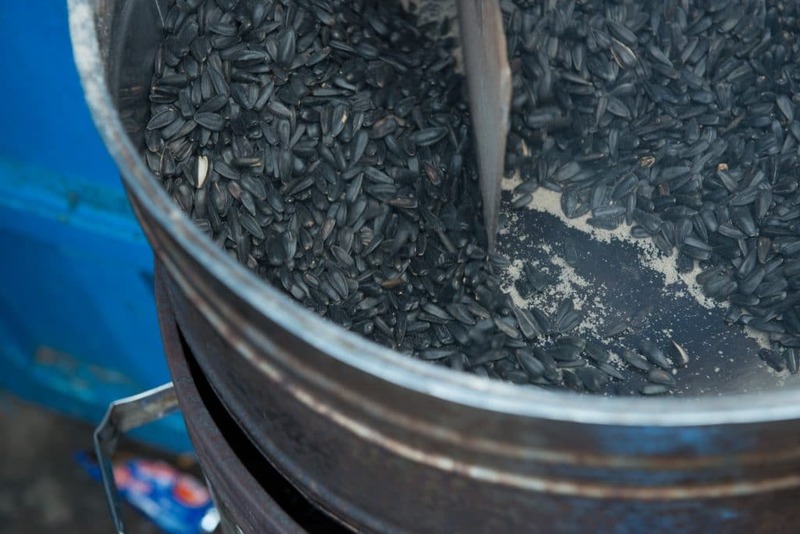 We saw large vats of olive oil for sale and could smell the wonderful aroma of roasting sunflower seeds. One thing to know about this city, is the people do not like to have their photos taken. You must ask permission first however it is often refused. The market square was as far a vehicle could go, so the rest of the journey would be on foot to reach our hotel. 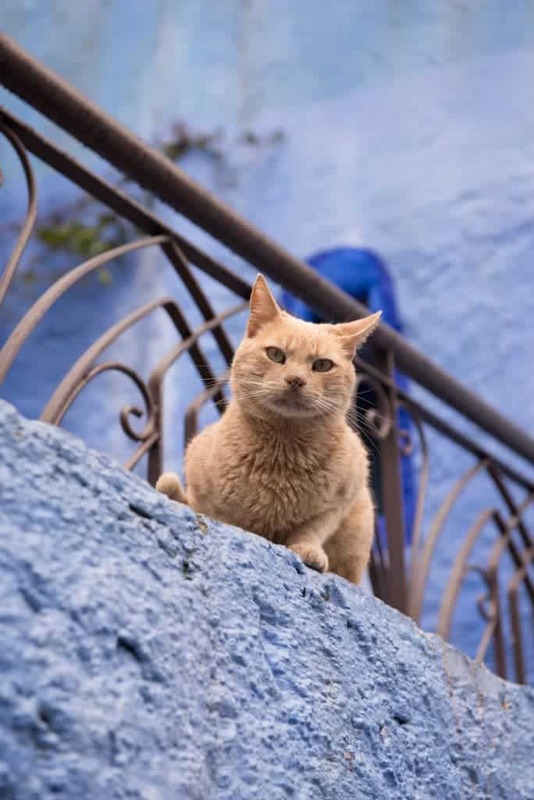 In fact, most of the narrow streets of Chefchaouen are not meant for vehicles. The square is part of the fortress that was designed to stop the Portuguese invasion. It was built back in 1471, created by Mulay Ali Ben Rachid, (considered to be a descendant of the Prophet Muhammad). It also served as a refuge during the Spanish Inquisition and Reconquista for thousands of Sephardic Jews and Morisco Muslims who were expelled during that time. 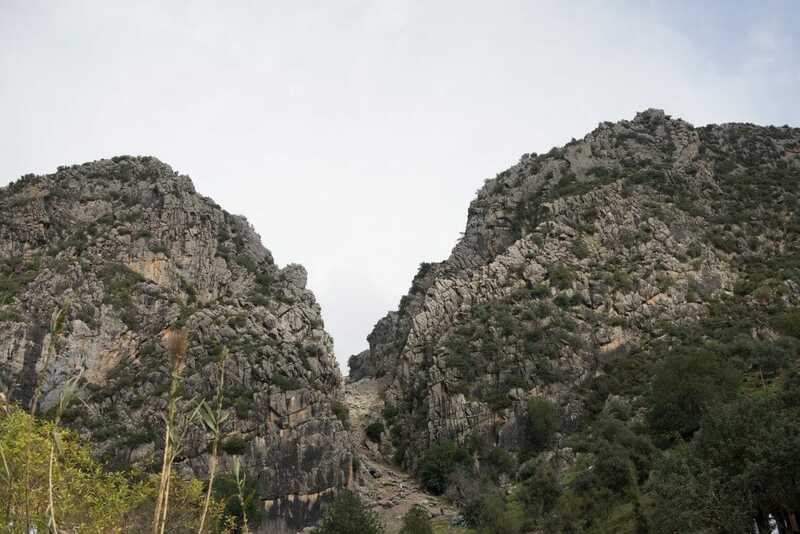 Up until the Spanish occupation in the 1920’s, the town’s mighty walls were closed to visitors and other religious groups. 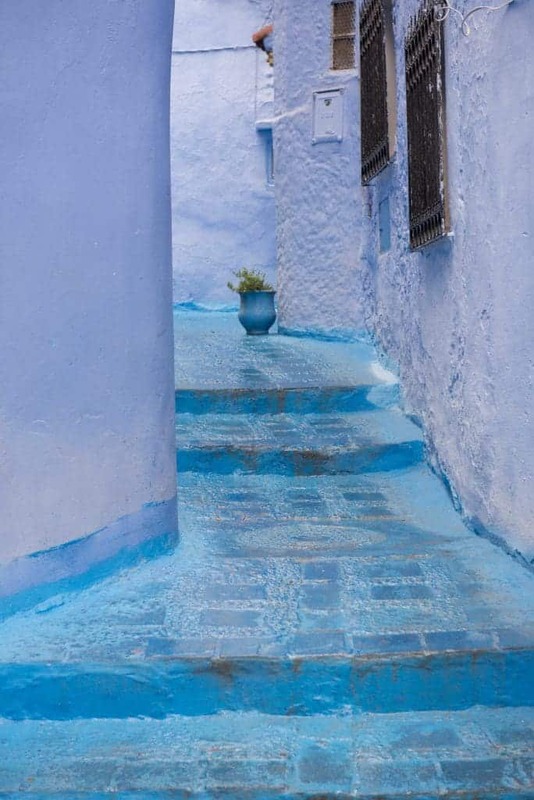 It is thought that the reason the city is painted with every conceivable shade of blue, was influenced by the Jewish religion. 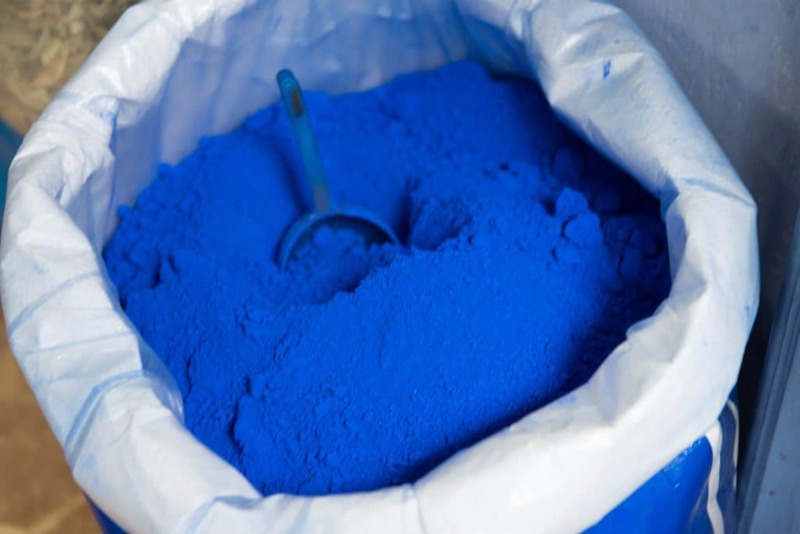 It is also believed that the color blue, is a mosquito repellent. To the Jews, it is a holy reminder of God’s power. 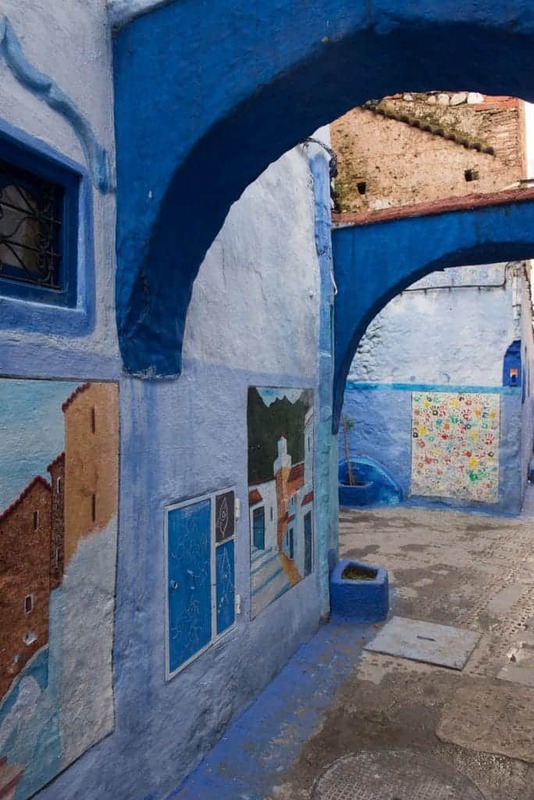 The same blue painting was done to the homes in the ancient Israeli, City of Safed. 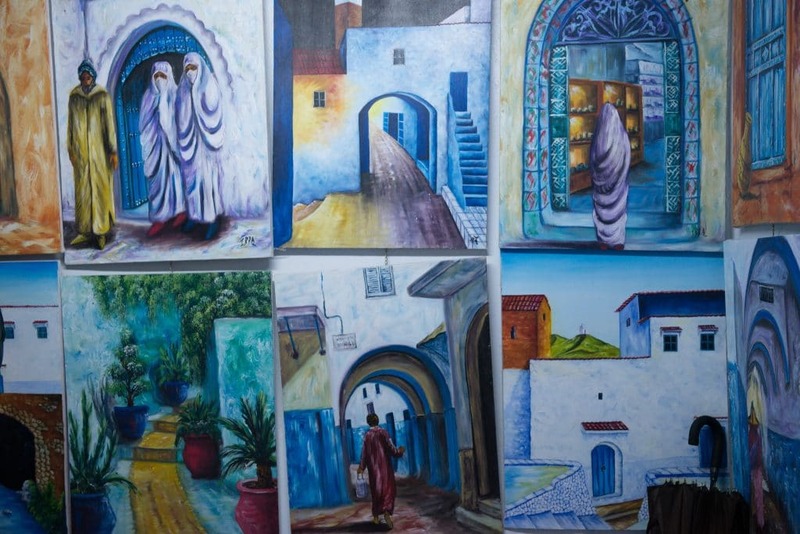 Although the Jews are now a minority, with only a small area known as the Jewish Quarter remaining, in the mostly Muslim city of Chefchaouen, the painting continues. 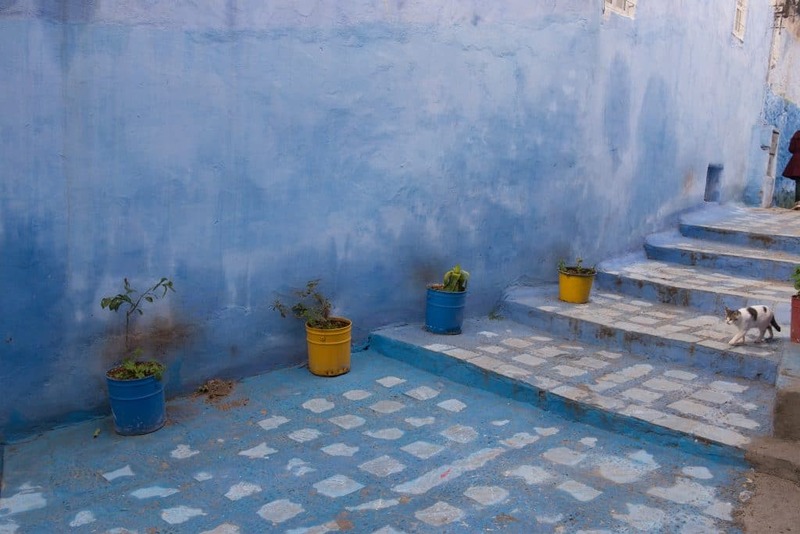 Every spring the women get out their favorite shade of blue and give their homes, outside doors and walls, a touch up. The hotel manager met us at the square and helped us with our luggage through the serpentine pathways, when we finally arrived at the Riad Cherifa. The hotel is small, with only a dozen rooms. 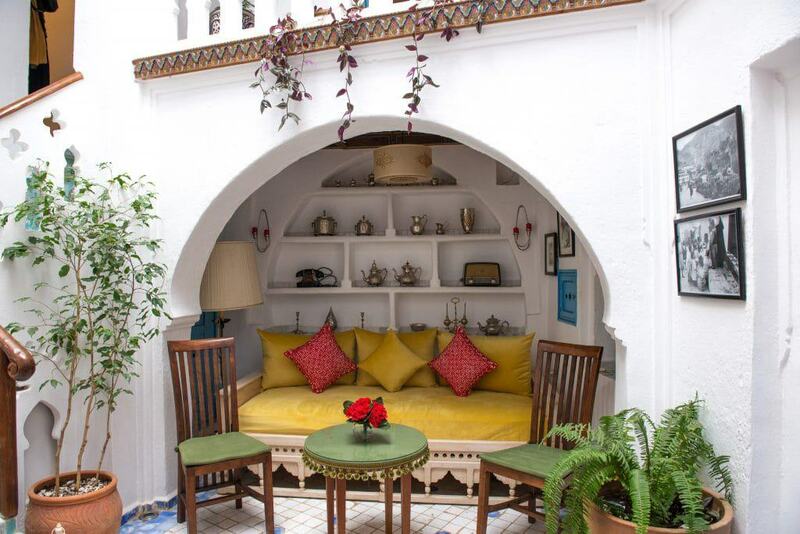 When we walked in and were struck with the beautiful, authentic décor that is so purely Moroccan. 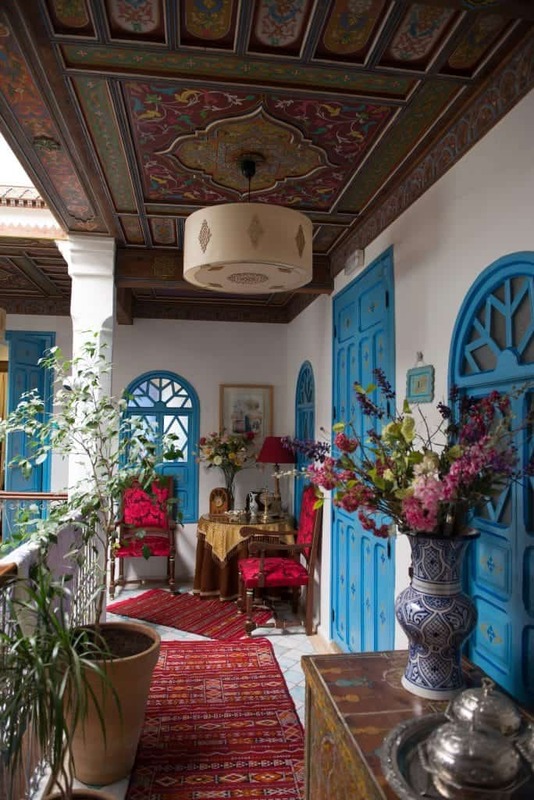 The details and colors are stunning and little vignettes fill every corner. There were receded lounges with pillowy sofas; places to simply relax and take it all in. As the clerk checked us in, we were escorted to a comfortable couch and a low table where we were served mint tea and three different types of cookies. As we only had 24 hours in this amazing city, we didn’t want to waste a moment. We dropped off our bags and within minutes our local tour guide, Ali, appeared. He gave us a brief history lesson as we toured the many amazing sites. There were walkways that had stunning artwork and murals painted on the walls. There were water fountains with blue hoses. We saw blue light posts and even the rare graffiti scribbling was blue! Ali even took us to the local baker after we saw people walking around with loaves of bread. He told us that the dough is made by the locals and they take it to the baker where his oven is used to bake it. 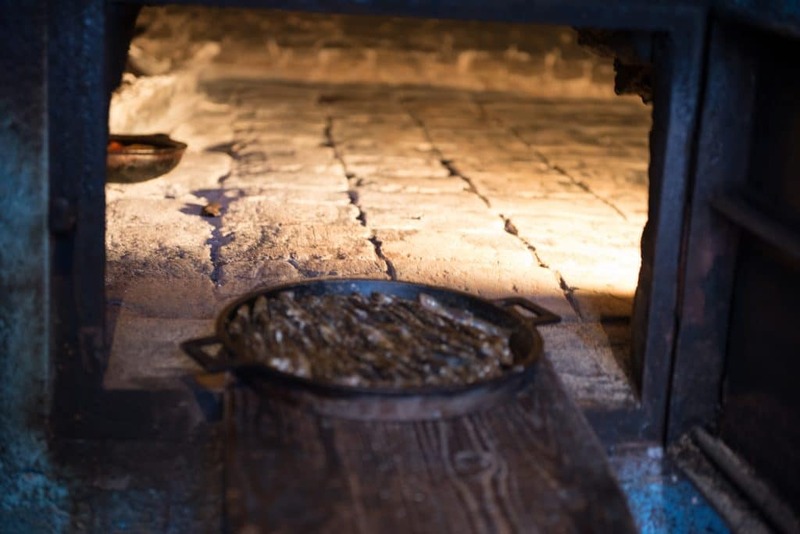 The smell of fresh bread wafted through the air. There is a simplicity here, as though life stands still. The city has a population of about 42,000 people, who all seem to know one another. On our tour, one thing that was noticeable everywhere, were cats. 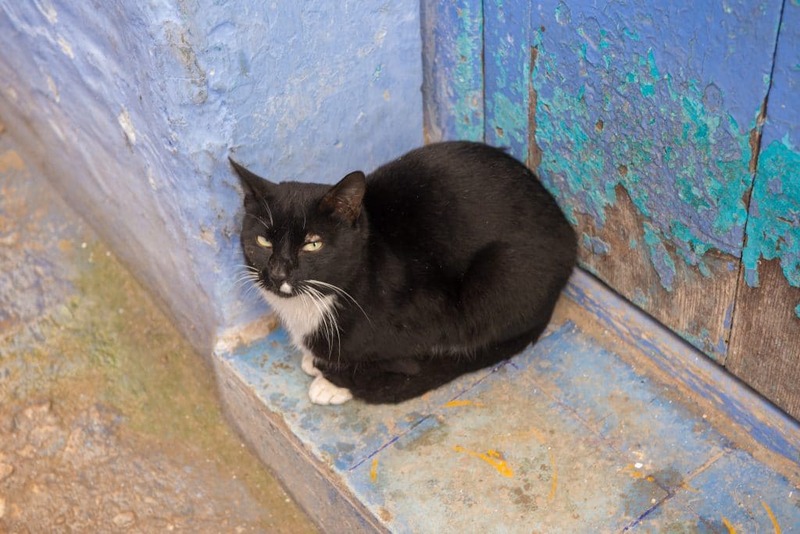 There are many in this small city as they are considered the pet of choice, since they are considered “clean” animals. They often pose for a lovely picture, as they sit aloof and confident, in front of the blue backdrops. After our tour, we had a wonderful lunch of kebabs and fries in an upstairs, restaurant terrace. After our meal, we headed back to our hotel for a scheduled hammam, a kind of steam/exfoliation bath. (more about the hammam experience in another post.) All I will say is that it was a hammam to remember. We enjoyed dinner at a local restaurant and slept soundly in our comfortable rooms. We awoke early the next morning to walk to the top of the city walls and take in the view. The city takes on a magical element in the quiet of the morning. The merchants would not open until 11:00 am, as it was Friday and Couscous Day, as they call it; similar to a Sunday in the United States. While we were wandering along the meandering paths, we encountered a man trying to feed a cat part of his doughnut that he had on a ring with other doughnuts he had just purchased. The cat did not seem interested so the man stood up and offered the rest of the doughnut for us to try. We each took a piece and fell in love. This doughnut was hot, crunchy on the outside, doughy on the inside and we had to have more. The nice man directed us to shop where we could obtain them and we bought a ring of them for next to nothing. I think they were about 20 cents each. 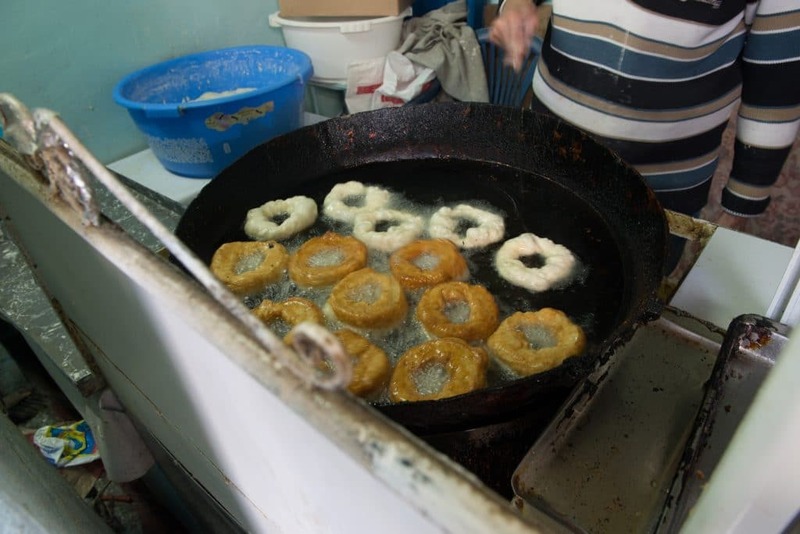 The makers of the doughnuts allowed me to take pictures of them cooking. 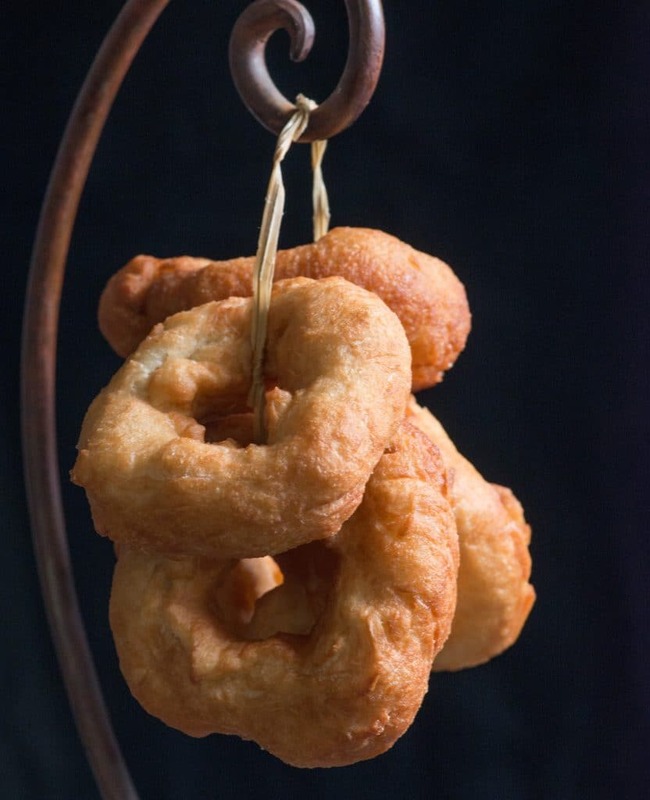 I have since found a recipe that is pretty darn close, so you can try them at home, until you have the opportunity to go to this amazing, little Blue City yourself. We went back to the hotel for breakfast, where they thankfully, had more of those delicious doughnuts. We had an egg, with bread, served with olives, honey, orange marmalade, and goat cheese. The yogurt with rosewater, was topped with raisins and honey; delicious. Fresh tangerines were also served. My sister, Dawn, fell in love with the honey and the waiter upon hearing this and without provocation, took off down the street to buy her a jar to take home. I later needed to get some spices for an authentic tagine dish I was to make for our Morocco International Cuisine meal. The manager upon learning this, insisted we follow him to the nearby spice store. Never had we encountered people so genuinely willing to make sure we were happy and satisfied without wanting a thing in return. They were simply gracious and kind. 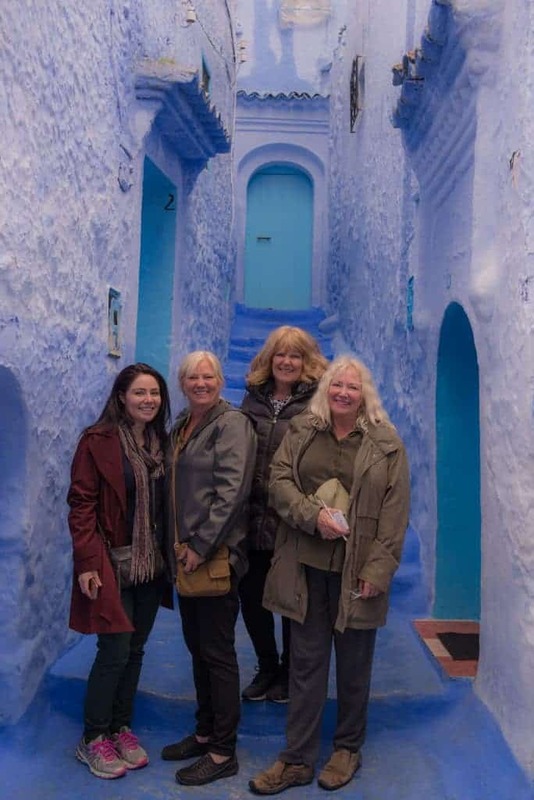 It was so wonderful to experience true Moroccan hospitality. The same driver, Mustafa, arrived to take us back to the ferry. 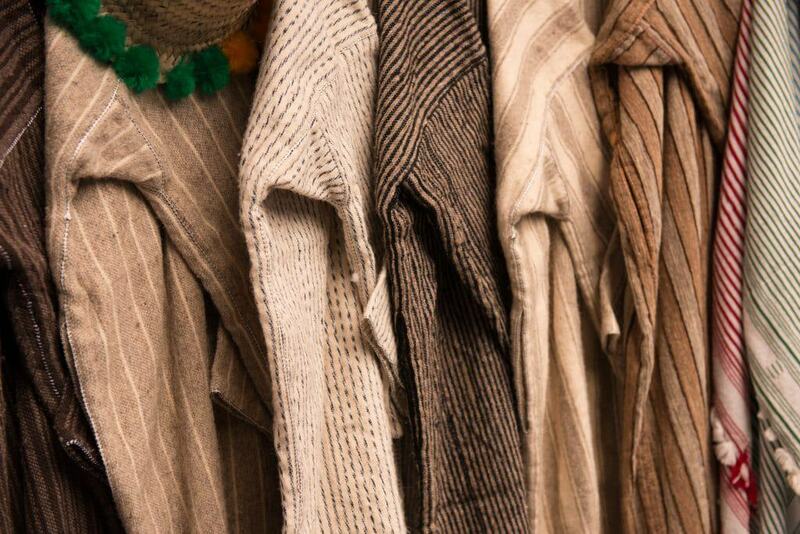 He was wearing his Jalaba; the traditional dress of Morocco and worn by most of the men in town. It is a long, woolen dress-like robe with a cone-shaped hoodie. He safely returned us to the ferry and we said goodbye to our new friend. To say thank you, you say Shukraan, however in the Blue city they say it with a couple pats of their hand to their hearts as a sign of sincerity. 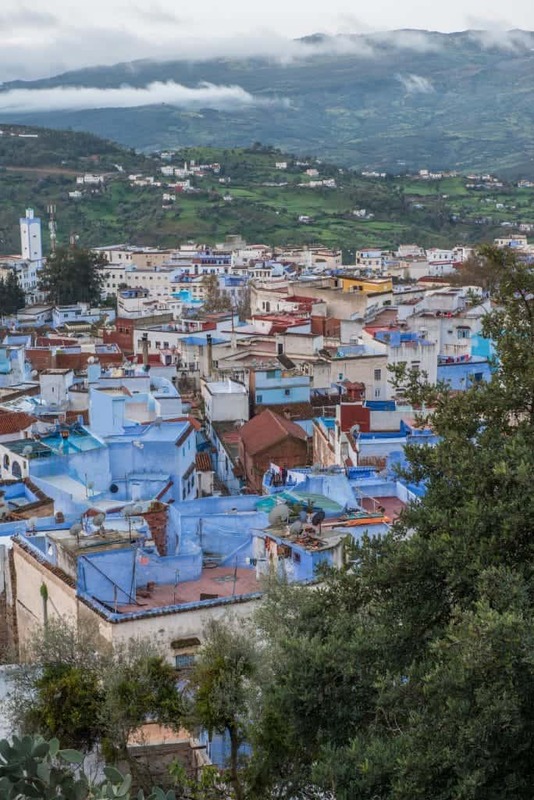 I think we all left a piece of our heart in Chefchaouen and we hope to one day to return. Great Story. Great fun! Thanks for sharing . You are most welcome I am so glad you enjoyed it!